The candle light gives a feeling of peace and comfort. The candlesticks of various form, size, with herbage stalks décor adorn Your home; the craftwork illuminated by peaceful light of a candle reveals the incredible beauty of nature – its shadings and facture. The most candlesticks have the shape of a circle – the perfect figure, the symbol of harmony. The number of candles in each candlestick has a symbolic meaning: two candles stand for a couple, in and jan; three candles stand for Christian Trinity; four candles stand for the cycle of the seasons, four basic elements: fire, water, earth, air; five candles stand for the five senses – it is the number of human; seven candles stand for the seven days of a week, seven music notes, seven planets – it is a number of body. The candlestick with a figure of an angel represent the Christmas, the figures of birds are Easter and spring attributes. Seven candles stand for the seven days of a week, seven music notes, seven planets – it is a number of body. Round candlestick for one little candle. Round big candlestick for one big (6 cm) candle. Round candlestick with bird for one candle. Rectangular candlestick with two birds for one candle. Round candlestick with three birds for one candle. Round candlestick with pigeon for one candle. Round candlestick with moon for one candle. Round candlestick for one candle with angel with little pipe. Rectangular candlestick with angel for one candle. Rectangular candlestick with two angels for one candle. Candlestick with clover for one candle. Candlestick in-jan for two candles. Triangle candlestick for three candles with herbage (straw, nettle, sweet-flag...) stalks décor. Three candles stand for Christian Trinity, pigeon - holy spirit. Candlestick for three candles with herbage (straw, nettle, sweet-flag...) stalks décor. Three candles stand for Christian Trinity. Rectangular candlestick with angel for four candles. 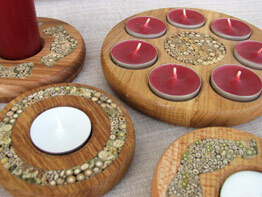 Four candles stand for the cycle of the seasons, four basic elements: fire, water, earth, air. Round candlestick with ring for four candles. Round candlestick with Celtic cross for four candles. Round candlestick for seven candles.